Leominster, MA – August 8, 2014 – Leominster Credit Union contributed $1,000 to the YWCA of Central Massachusetts for their Dance for Peace event. Funds raised at this event will support the YWCA’s BWR program to end domestic violence. Founded in 1954, Leominster Credit Union (LCU) is a member-owned, not-for-profit financial cooperative with a full range of deposit, lending and other financial services. Headquartered in Leominster, Massachusetts, LCU is proud to claim nearly 50,000 members and more than $600 million in assets. LCU has seven branch locations in Leominster, Worcester, Clinton, Holden, Sterling and North Leominster with ATM services at all branch locations. 24-hour online banking services are available at www.leominstercu.com and by telephone at 800-649-4646. 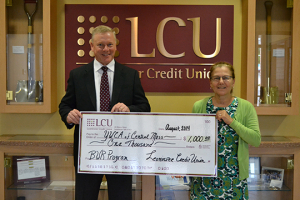 John J. O’Brien, LCU President and CEO presents a check for $1000 to Linda Cavaioli, Executive Director of the YWCA of Central Massachusetts for their BWR Domestic Violence Prevention Event.